Eyes are active organs in a dog's body. The eye possess delicate parts which are exposed to the external environment. Thus, they always remain at risk to environmental factors, allergens, microbes etc. The layers of dog eyes are very soft and are supplied with a rich blood supply and nerves, making it more sensitive. 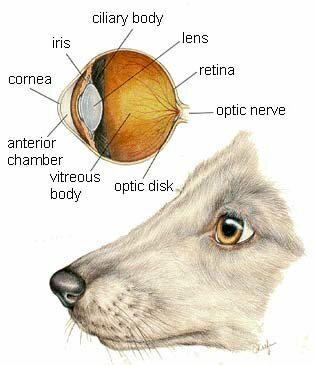 Functional areas of a dog eye are protected with layers called eyelids. Tear sacs keep the eyes moist. Eyelid blinking keeps the fluids dispersed over the surface of the eye and it keeps the eye surface free of any external elements that could hard the eye. In the case of a canine eye health problem, the protective coats of the eye such as the eyelids, conjunctiva, tear sacs and external parts are more prone to canine eye infections. That is why, dogs with eye problems are most commonly reported to have conjunctivitis (pink eye), canine blepharitis (inflammation of eyelids) and Dacryosystitis (inflammation of the dog tear Sac). Bacteria, viruses and other microbes can cause a primary form of canine eye infection, but in many cases, it is possible that eye infections may occur as a secondary problem, which means it is a result of another condition such as glaucoma, atrophy (muscle weakness0, ulcers, dog Cherry eye, tumors and a parasitic infestation (mange, flea infestation) over the face. he picture in this section are reprinted with permission by the copyright owner, Hill's Pet Nutrition, from the Atlas of Veterinary Clinical Anatomy. These illustrations should not be downloaded, printed or copied except for personal, non-commercial use. The following are the most common parts of dog eyes, which are usually affected by bacterial, viral or microbial infections. Canine Blepharitis: Blepharitis refers to inflammation of the outer eyelids, which usually occurs as a secondary complications of generalized dermatitis, glandular infections and irritation caused by dermal parasitic infestations such as dog mange or a flea infestation. Fungus, bacteria and parasites can cause infection in the eyelids, which can spread to other parts of eyes, if is not treated properly. Canine Conjunctivitis: Conjunctivitis in dogs is also called pink eye. It is inflammation of the conjunctiva and is the most common of all canine eye infections. Causes of this condition range from microbes to environmental allergens and irritants. Usually, any serious dog eye problem initiates from inflammation of the conjunctiva and if it is not treated properly, it may cause secondary complications in other parts of the dog eye. In the outer layers of the dog eye, conjunctiva is considered the most sensitive part. Along with primary canine conjunctivitis, which is caused by bacteria, virus or allergens, secondary conjunctivitis can occur due to dry tear sacs, glaucoma, conformational abnormalities, dog cherry eye and certain tumors. Canine Dacryocistitis: This is generally termed as inflammation of the dog tear sac, which occurs after an obstruction of the tear sac. Obstruction usually occurs due to foreign objects, allergens, microbial activity and mechanical obstruction. Microbes may grow in the tear sac and thus cause a form of canine eye infection, which is potentially harmful to other parts of the eyes as well, i.e. it causes secondary infections and redness in the eye. Inner Canine Eye Infections: Inner eye infections in dogs are more complicated and relatively dangerous forms of eye infections. The inner parts of the eye, such as the inner cornea, lens, retina, choroid and orbit may become inflamed due to either primary or secondary dog eye infections. Inner canine eye infections usually are secondary to ulcers, atrophies, tumors and outer canine eye infections. These infections can lead to permanent failure in eye function. The eye, being a sensitive organ, ultimately responds to any problem. It occurs because of the rich vascular and nerve supply. Inflammation is the most common response to a dog eye infection or allergy, as are typical symptoms of inflammation, i.e. redness, swelling, pain, loss of function and elevated localized temperature are some of the initial signs noted where there is an immediate dog eye problem. Eye discharges, extreme redness, pain and irritation turns into prominent and severe symptoms in the latter stages of dog eye disease, while swelling may recur in advanced stages. Different forms of eye infections in dogs may exhibit different symptoms according to the severity, involvement of different parts of the eye and the overall hygienic status of the eye. The severity of the condition is sometimes not important clinically, even the mildest form of canine eye infection can cause severe symptoms in dogs. Clinical history, examination and thorough observation of the severity of the dog eye infection is the initial, but most important step towards diagnosis. Researchers believe that clinical observations should be focused on two points, i.e. identification of any eye problem in a dog's history in order to determine if the condition is acute (sudden) or chronic and to define the severity of the condition, i.e. symptoms and any chance of involvement of other parts of the dog eyes. This is important, because even the acute and mild form of a dog eye problem can cause very severe symptoms such as inflammation and eye discharge. Laboratory diagnosis is important for differentiation of one dog eye disease vs. another and for confirmation of the condition. In secondary complicated cases, laboratory diagnosis is considered essential. This can be done by culturing and isolating microbes in the eye discharge, examination of scrapings under the microscope and a Schirmer tear test etc. Like other infections in the body, dog eye infections are specifically treated with specific therapeutics such as antibiotics, steroids and supportive measures. Drugs are available in specially formulated eye ointments, creams, drops and solutions. A very rare number of dogs with eye infections might require a general treatment plan such as the oral administration of drugs. Along with the administration of specific drugs, as prescribed by a veterinarian, supportive measures and care is important. Different measures such as keeping the eye and its surroundings clean with an antiseptic solution is required. Similarly, a patient should be housed in space which is free of allergens and environmental factors which may worsen the condition. Along with the administration of antibiotics and steroidal preparations, regular dog eye cleaning is essential to minimize the microbial population. In order to clean the surroundings of the eye and to improve eye health, natural remedies can be used in support along with specific prescription drugs. In mild cases, these natural remedies can help in treatment as well. For cleaning, consider a natural remedy such as i-Clenz, and for general dog eye health support,consider a natural remedy such as Eye Heal.